At some point during several ramblings on a recent Maltercation the subject of obscure New England breweries came up. I mentioned that I’d be heading to Maine for Memorial Day and the Professor recalled a recent trip in which he had a spectacular, reserved selection from Shipyard Brewing that was quite impressive. Color me intrigued; it’s time for some Maine brews. As far as New England states go, Maine enjoys several luxuries that the rest of the group do not. Lobster prices are so low that it’s often cheaper to grab a couple of Chix (1 – 1 1/4 pound lobsters) than it is to get steaks for the grille. Maine sits far enough away that ski resorts very rarely have obnoxious, pushy, jean-clad downhillers that fill most of the VT and NH slopes (Some people call them New Yorkers, but that can’t be right, can it?). Lastly, Maine has one brewery for every 40,000 people, which ranks the state #4 nationally. I’ve had plenty of Maine brews in the past, mostly from Allagash and Shipyard, but to get a little perspective I grabbed three very different beers to see what the great state has to offer. Sitting on the porch in Down East Maine with a beautiful view of the waves crashing ashore, my lineup consisted of Sebago’s Hefeweizen, Gritty McDuff’s Red Claws Ale, and Shipyard’s XXXX IPA. Tasting from light to dark, and owing to the fact that it was 90 degrees out and my face was melting off, I went with Sebago Brewing Company’s Hefeweizen first. Sebago is a brewpub chain with a few locations up and down the seaboard that also has a larger scale brewhouse in Gorham (Portland area). This is actually the first time I’ve come across their beers in a grocery store so I was pretty excited to check them out. True to style, the 12oz sampling poured a hazy/cloudy gold with at least 3 inches of head. I had the six pack sitting on its side in the fridge and noticed ample sediment the entire length of the bottle, always a good sign. Nose was citrusy, almost on the lines of a Witbier, but came back to the hefe side with suptle hints of banana and clove. Taste is über refreshing with lemon zest mixed into an enormous envelope of tightly-knit bubbles. Insanely drinkable, the Nurse and I had no problem ripping through the rest over the course of the weekend. This hefeweizen has a 3 hop rating written all over it. Next on the list comes the Red Claws Ale from Gritty McDuff’s out of Portland, ME. Gritty’s is a staple on the Maine beer scene with a couple of brewpubs to go along with a stellar everyday lineup. I’ve always enjoyed their Pub Ale (Pale), Black Fly Stout (Dry Irish Stout), and Halloween Ale (ESB), but I’ve never tried any of their more obscure offerings of which there are very few. Coming from the title I’d guess that the Red Claws is an American Red (Beeradvocate.com concurs) but Amber Ale seems to fit the class. Who knows, it looks like a beer so we’ll just leave it at that. There is a cool story, well kinda cool I guess, since this is the “Official” beer of the Maine Red Claws, an NBA D-League team. Click here for the press release if you’re interested. I poured the Red Claws from its 22oz shelter into a shiny, semi-clear, red plastic cup. The only reason I point this out is because my father at first handed me just the bottle along with an opener as he assumed I just really wanted a big beer. Alehead, he is not. Nose was bitter up front with a touch of sourness in the end. Sweet malts hit you more on the tongue than on the nose but they’re present throughout. Overall I wasn’t inspired by the brew but it’s certainly not bad. Drinkability is on the low side but if I ever find myself at a D-League game I’m sure I’ll toss back a few. I didn’t find as much complexity as I was hoping for – Oh well. I’ll go with a 2.5 hop rating, which is definitely the lowest rating that any of Gritty’s beers will get from me. They won’t bowl you over with a 4-hopper anytime soon but they more than make up for that with a better than average standard lineup that never disappoints. Last on the list, since it had the potential to burn my taste buds off, is the XXXX IPA from Shipyard Brewing Company. Once again we’re dealing with a brewery from Portland, which leads me to believe we need an immediate Portland, ME vs. Portland, OR Maltercation taste-off. Shipyard is to Maine what Sam Adams is to Massachusetts. Go into any bar, restaurant, or retail location and you’re sure to find something from them in stock. The XXXX IPA, an Imperial IPA, is part of the Pugsley’s Signature series that also includes their Barley Wine, Imperial Porter, and Smashed Pumpkin Ale (It was the Smashed Pumpkin that the Professor was referring to). At 9.25% ABV the XXXX hits you in the nose with some pronounced booziness but the floral hop presence takes care of that pretty quickly. The 22oz bottle poured into a brand new, clean, red plastic cup leaving a glorious tan head that remained intact from start to finish. Piney hops hit the tongue first followed by bittering citrus hops and a semi-malty finish. Effervescence was higher than I would have thought, but the mouthfeel is still slick. Lots of heat from the alcohol puts out most of the sweetness so you’re left with an incredibly balanced, supple, groin-grabbingly good brew. 3.5 hops from the good Doctor for a highly drinkable Imperial IPA. This is a can’t miss beer if you ever find yourself heading up Northeast to get in on some Down East comforts. I’d love to hear from some other Aleheads (Or brewers if you’re on here) on the virtues of Maine brewhouses. I’m not as partial to the New England brewing scene as some of my cohorts but I do believe that Maine can run with the best of em’. 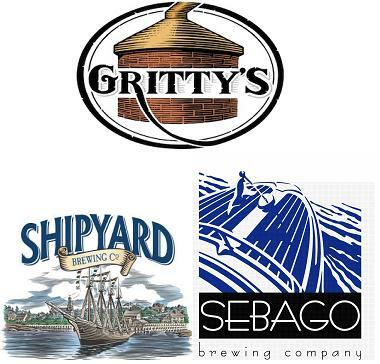 Posted in Tasting Notes.Tagged Gritty McDuff's, Hefeweizen, Maine, Red Claws Ale, Sebago Brewing Co., Shipyard, XXXX IPA. Next Post DESCHUTES, HE SCORES!